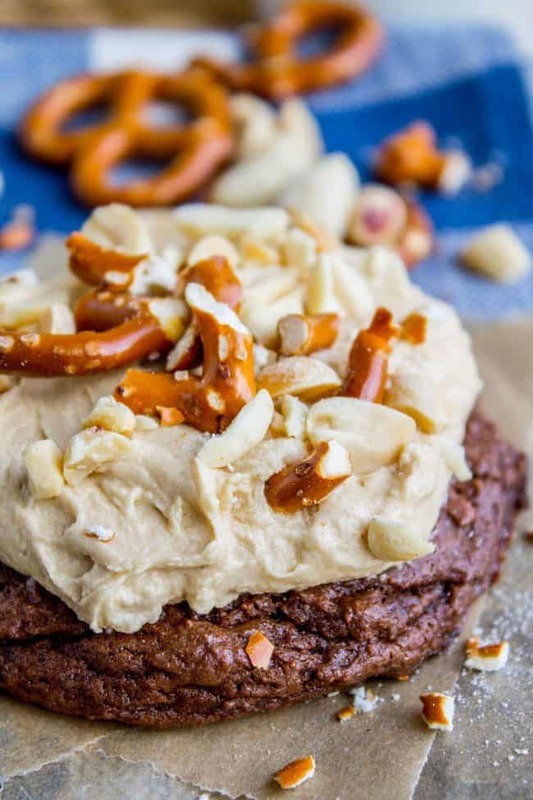 Super soft recipe for decadent chocolate cookies, slathered with rich peanut butter frosting, then topped with chopped pretzels and peanuts! These cookies are a whole different experience! Well, it didn’t work. My diet, that is. (I’m sure these cookies had nothing to do with it.) I’ve never really been on a diet before, unless you count baby weight. The diet was partly the result of a bit of a swimsuit fiasco. We are going to Australia on vacation, and I needed a new swimsuit. I found this one and bought a size 8. I could barely get it on. So I sent it back and got a 10. STILL could barely get it on, but once it was on, it fit perfectly. But I didn’t want to have to do gymnastics every time I got dressed, so I ordered the 12. That one was too big. What’s a girl to do?? Keep the size 10 and go on a diet of course. Clearly I should be investing in another swimsuit, but I’m in too deep now. I asked my mom to reinforce all the seams for me. (Thanks Mom!!) Hopefully I won’t bust a hole in it while I’m on vacation!! Wish me luck! Although I suppose it’s pretty rich to be asking for luck when I keep making stuff. 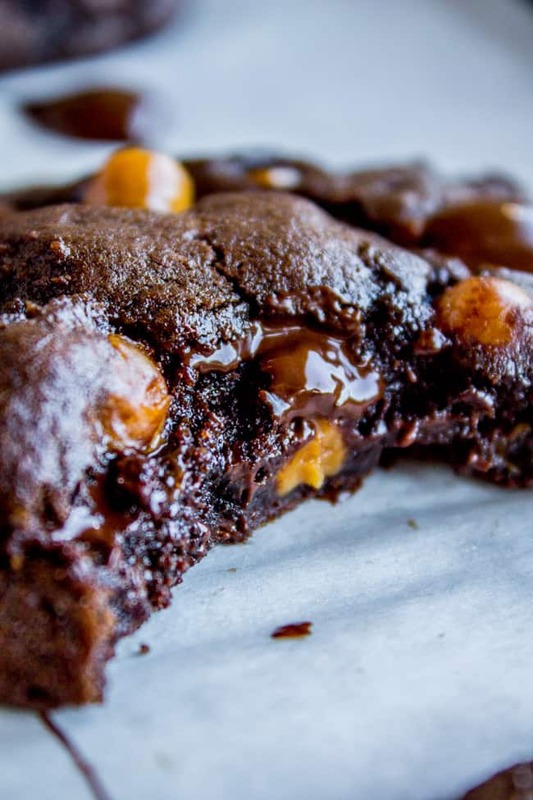 Decadent stuff, like these chocolate cookies. I love me a good crispy cookie every now and then (like these Classic Gingersnaps) but my heart truly belongs to soft, chewy cookies that are gooey and decadent. And warm. With a glass of milk. Well these chocolate cookies definitely deliver. They are super soft because there is sour cream in the dough. It makes for a little bit more of a cakey cookie, but not so much that you feel like you’re not eating a cookie, if that makes sense. They are still rich and tender. And then to balance out all the rich tender gooeyness, I topped off each cookie with a healthy sprinkle of crushed pretzels and chopped peanuts. This is totally optional, but in my opinion adds a little something special to these cookies. It makes them fancy and unique. They would be great to make for a baby shower or a party where you want to impress. Let me know if you try them out! Next I’ll be posting a salad. No, seriously! I know salads are uncommon around here. It’s the salad from Buca di Beppo…that I promised I would be posting next on my LAST post. You guys are going to start thinking I’m bluffing. Just you wait. 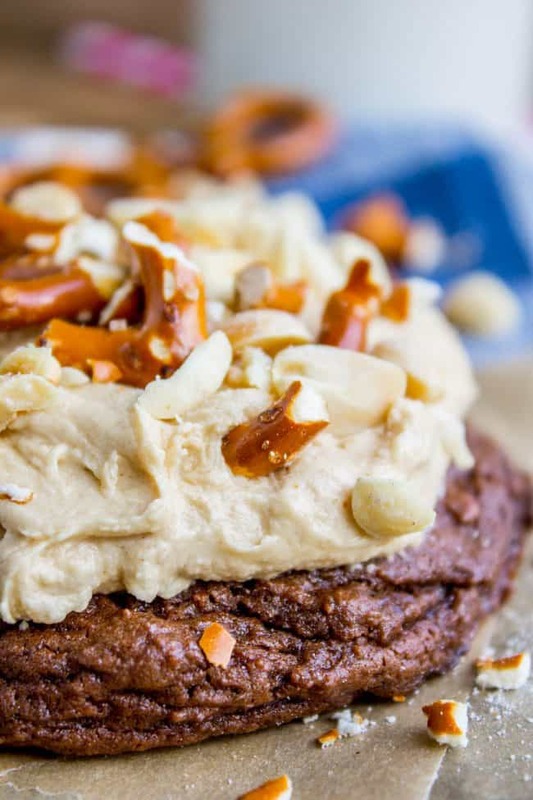 Super soft and decadent chocolate cookies, slathered with rich peanut butter frosting, then topped with chopped pretzels and peanuts! These cookies are a whole different experience! In a large bowl or stand mixer, beat butter until soft and fluffy, 2-3 minutes. Make sure you scrape the sides and bottom of the bowl. Add sugar and brown sugar and beat for another minute. Add the egg, sour cream, and 1 teaspoon vanilla. Beat well. Add the flour and cocoa powder but do not stir. 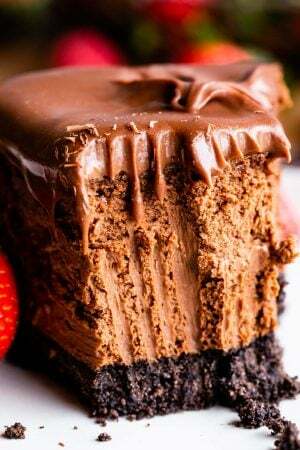 Use a small spoon to stir the baking powder, baking soda, and salt into the flour and cocoa powder. Beat until just barely combined, scraping sides and bottom as necessary. 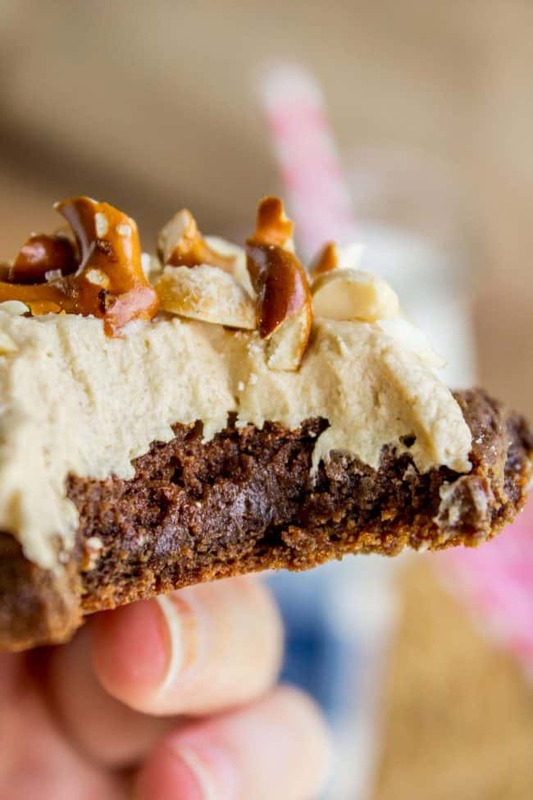 Use a cookie scoop to form balls of dough. You want them to be about 2 inches across. Preheat your oven to 350 degrees F. Line a few baking sheets with parchment paper or a silpat. Place the chilled cookies on a baking sheet with about 2 inches between each cookie. Bake in the preheated oven for about 10-12 minutes, until the top has just barely lost its shine. Remove from the oven and let cool 5 minutes on the pan. Transfer to a cooling rack and let cool completely. Repeat until all the cookies have been made. Meanwhile, prepare the frosting. In a large bowl or stand mixer, beat the butter until smooth. Add the peanut butter and beat until smooth, scraping sides and bottom. 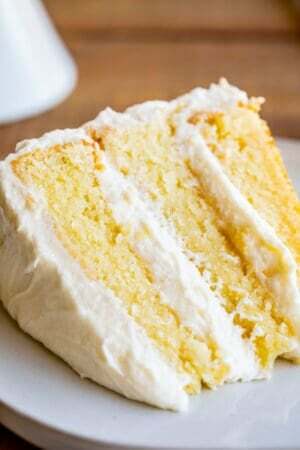 Add the powdered sugar, milk, and 2 teaspoons vanilla. Beat until combined, scraping sides and bottom. Frost the cookies once the have cooled completely. 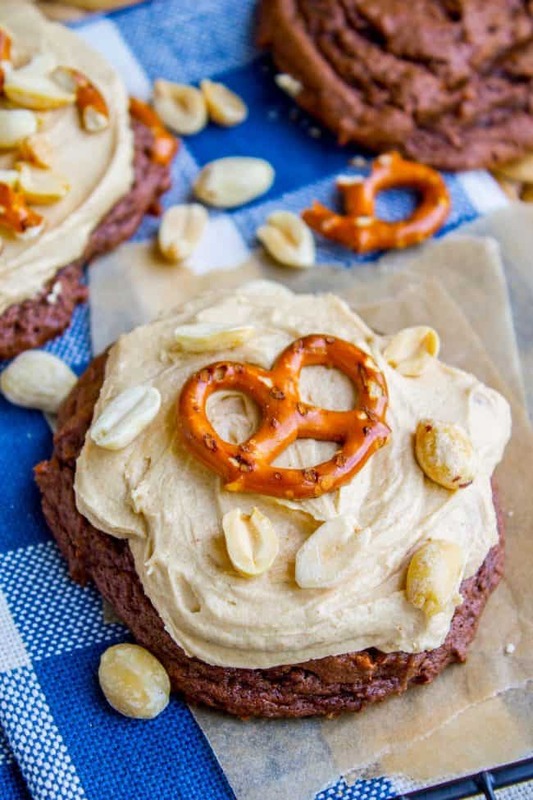 Immediately after frosting, sprinkle each cookie with chopped pretzels and peanuts. This step is optional, but I love the crunch of flavor it adds! 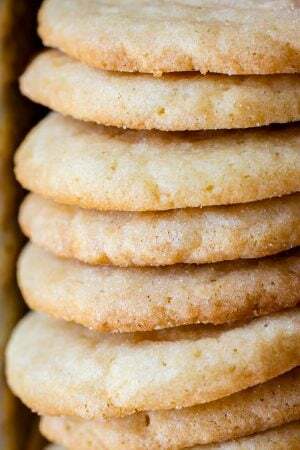 This cookie recipe is from Ruby Snap bakery in Salt Lake City. The frosting recipe is from my sister-in-law Jessie. 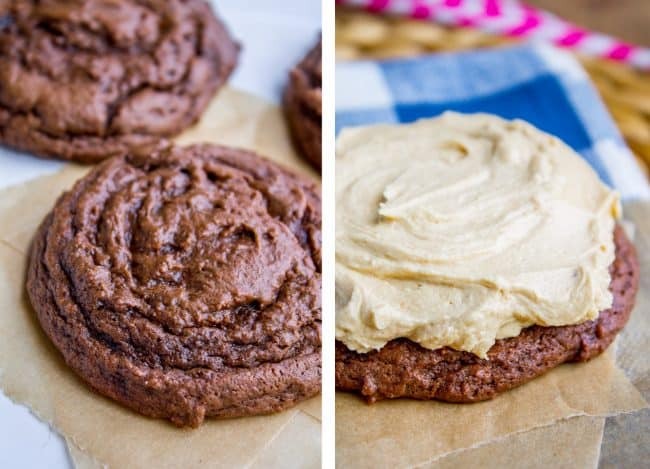 More decadent cookies you will love! 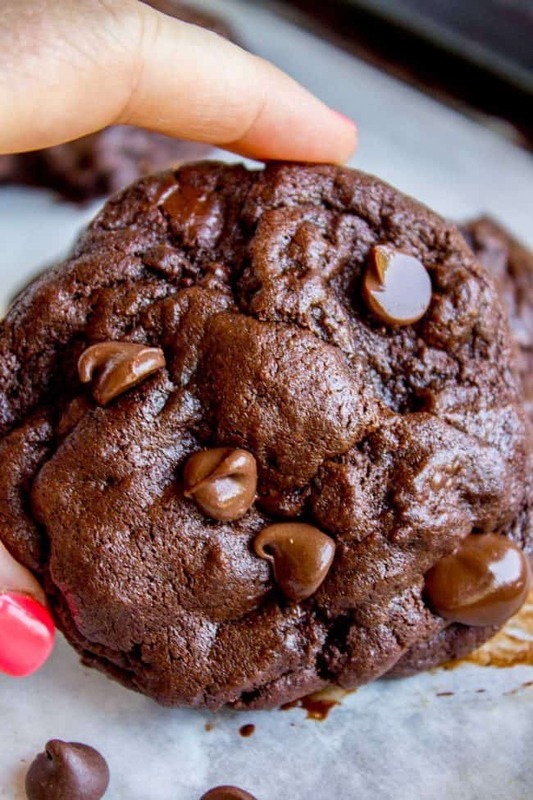 The Best Bakery Style Double Chocolate Chip Cookies << these are seriously next level. 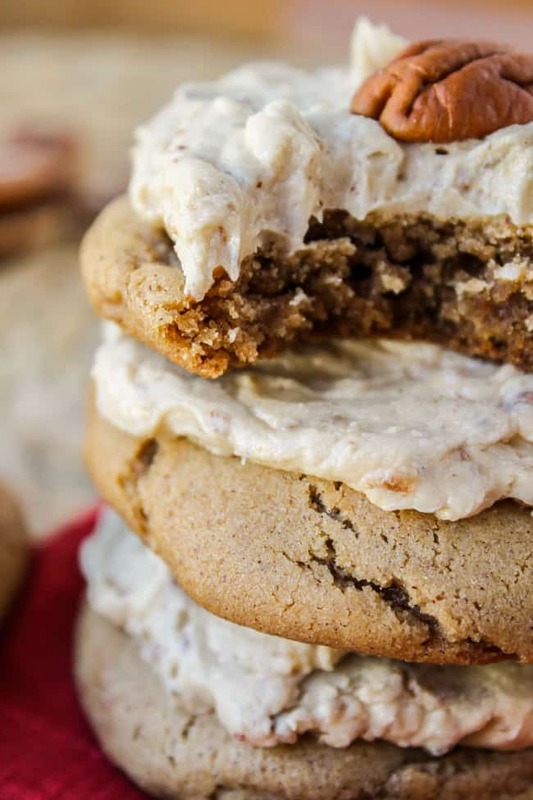 Soft Cinnamon Cookies with Maple Pecan Frosting <loooove these! More cookies from other bloggers that you will love! Best peanut butter icing I’ve ever tasted. Thank you! It’s a keeper! It’s good stuff Amy! I’m so glad you liked it! thanks for the comment! Thank you Zara! I love your name, I’ve never heard that before. It’s pretty! 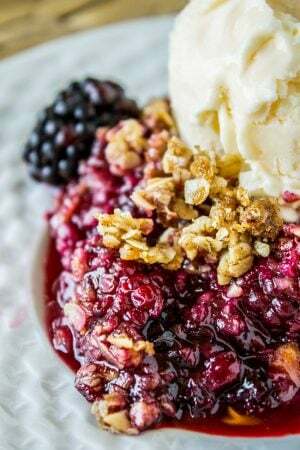 This recipe is printing with the entire Amazon web address for the parchment and silpat, as well as the baker website and frosting website (not just links for each of these)! Can that be fixed so it prints properly? Hey Catherine! That is annoying! I will ask my tech people to go in and fix it! Thanks for letting me know!